Making it as a musician can be tough, no matter how talented. But some NIU musicians have used their resources and skills to find a niche in the television market. 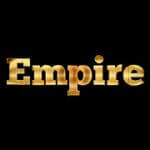 Filmed in Chicago, the show is about a music mogul whose family is fighting for control of his hip-hop empire. 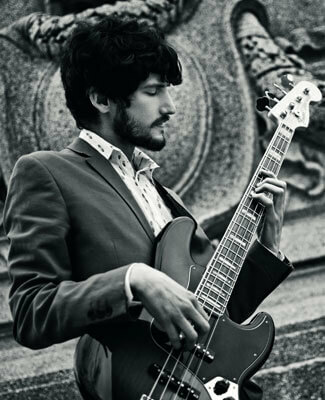 At 27, bass guitar player Lopatka (M.M. jazz performance, ’12) is used to being in front of a camera. In 2010, he appeared on “The Jerry Springer Show” as a singer and songwriter for Jerry’s Biggest Fan Contest, and then went on to appear in seven episodes of the Emmy Award-winning children’s show “Green Screen Adventures.” He also sang the national anthem with a pop band called The Lookers at televised NBA and MLB games in 2012. Although Lopatka and Kalvonjian (M.M. music performance, ’95) say their goal is not to make it in Hollywood, they have enjoyed the filming experience and the opportunity to meet people and expand their network. Lopatka has worked on the show for two seasons already and has met several famous people, including Jennifer Hudson and Patti LaBelle. When the show airs, the music is seldom theirs, but is track music from big names in hip-hop and rhythm and blues, Lopatka says. However, in the eighth episode of the show’s second season, the three of them recorded live on set with other musicians, he says, and they had a great time actually hearing one another play. 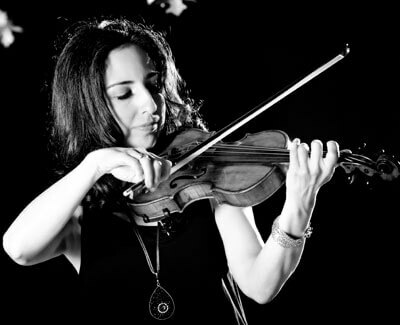 Like the other two, Kalvonjian, a violinist, got hired by Rich Daniels, who is the on-camera music director for “Empire” and books talent for other network TV shows filmed in Chicago. Lopatka adds that it’s fun, but can be exhausting. Off the show, each of them works in the music business. Thirty-eight-year-old Washington (B.A. music performance, ’04), who plays guitar on the show, is a band performer and teaches private guitar lessons. With her husband, Kalvonjian runs Sarlas Music, a special-events music company that provides music for about 150 private events per year. Lopatka performs at night clubs and private events with different ensembles, from jazz to rock, teaches private lessons, composes music for video games, has recorded on other musicians’ albums and has just started his own company, 3 Sigma Audio, to create audio plug-ins for digital recording. Music seems to be in their blood. Kalvonjian, who started playing the piano at age 8 and the violin at 10, recalls pulling friends off the street so she could play for them. Lopatka started playing bass at age 7 as a second choice when his mom said the drums were out since his older brother already played them. Because of their talent and ability to play a variety of music, the audiences seem to keep coming, whether Kalvonjian is setting up for an unforgettable wedding or Lopatka and Washington are getting ready to perform onstage. The TV show seems to have its music fans as well.